The weekend kicks off with a meat-n-greet party like we’ve never had before! We are moving our Friday night event to BEAR ALBANY Headquarters at ROCKS, 77 Central Av. There will of course be BEARAOKE, and our friends at ROCKS have arranged a special show that’ll be sure to bring you to your feet. BEARLESQUE is a cabaret group that puts the burl in burly. This musical troop combines men, fur and Fosse at its best! Shows at 11pm and 1am in between BEARAOKE rounds. Get out and explore NY’s Capital City! Lots to do – there is the New York State Museum, Ice Skating on the Empire State Plaza and loads more! After lunch, join us for a new BA favorite! Meet at Nine Pin Ciderworks Tasting Room at 3pm, 929 Broadway, Albany, NY to sample some delicious ciders. Various ciders and munchies for purchase - $1 off all ciders for the BEAR ALBANY happy hour group – cheers! There are also malls and movie theaters near-by so feel free to form your own group and host an outing. Too cold to venture out and explore? Enjoy the heated pool and spa at the host hotel, then rest up for the main event at ROCKS, 77 Central Av, Albany, NY. Doors open at 9 so get ready to party! We will converge on Dolan's Sports Bar at 75 Central Avenue (next to ROCKS) for brunch, lunch or whatever you want to munch. Plan on 11 am, which is also check out time for our hotel guests. 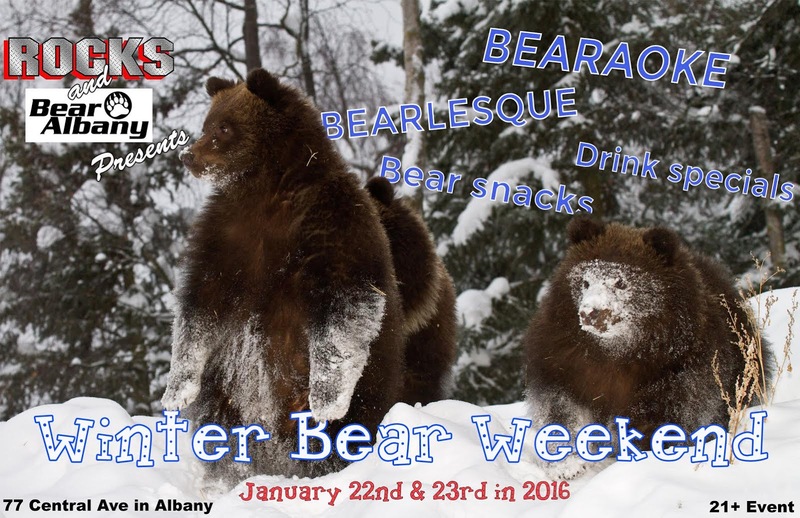 Be sure to mention you're part of the “BearAlbany group” to get the discounted rate and book early as the discounted rooms almost always sell out. Once you're out at the bar event, ask one of the BEAR ALBANY folks about the hospitality suite for complimentary refreshments and fun when the bar party is over.